It's been a whirlwind year for Rona Macaskill and husband Chris, who launched their home-based food business in March this year. Just five months into trading, their company, The Forest Kitchen, received two major food awards and an order from upmarket central belt delicatessen Peckham’s. A former physiotherapist, 33-year-old Mrs Macaskill and her husband, a 39-year-old joiner, launched production from their home in County Houses, Loch-end, with 43 slabs of tablet. By this month they should turn out 1000. Their whisky fudge, containing Balblair 1989 vintage single malt, started with nine bags. That figure is now 700 and rising — partly due to the delicatessen’s order for filling its hampers and sale in its shops. 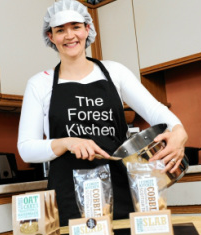 Production of Forest Kitchen’s oatcakes, made with Golspie Mill traditionally milled oatmeal, has gone from 21 packets to 600. It also makes bespoke wedding favours and shortbread for local customers. The couple invested £1000 to start up, paying for branding, design, ingredients and other sundries. The estimated annual turnover for the first year is £21,472 and hopes are high they will employ at least one other person by next year. Part of the success has been due to a Business Gateway course, run by Highland Council, which advised the couple to apply for any awards they could to bolster trade. In August the suggestion paid off when they took home two Great Taste Awards — a coveted two-star gold for the whisky fudge and one star for the oatcakes. Organised by the Guild of Fine Food, 7481 products from 1600 companies were entered for the awards, and 350 experts took 34 days to blind taste all the entries. "It was really a shock — we just could not believe we had got awards so soon," said Mrs Macaskill. "Since we started it has just snowballed. Our ambition is to keep expanding the business but we are passionate about maintaining the high quality as we expand. "We have so many options and opportunities to investigate." The idea for the business grew from the couple’s long-term goal of running a coffee shop and Mrs Macaskill’s love of food. "As we knew the coffee shop was going to take a long time we decided we wanted to start the business to get our name known and to have a market presence," said Mrs Macaskill. The couple, who have four children, deal direct with their customers and have so far resisted wholesalers — sending most of their supplies by FedEx. They are in the process of submitting a planning application to build a coffee shop and house on land they own in Abriachan, close to Abriachan Forest Trust and the Great Glen Way. The venture, which could be up and running by 2014, would also have a production space for the food business, with the prospect of creating jobs. The whisky fudge retails at £2 a bar and the oatcakes £1.70 a packet. Five pence from each sale goes to the Neuroblastoma Society which fights childhood cancer. The couple’s five-year-old daughter Phoebe has endured six months of chemotherapy for stage four neuroblastoma — a rare and aggressive childhood cancer — after being first diagnosed three years ago. She is now in remission. The couple’s three other children are Jude (9), Laina (8) and Ellis (2) — and the aim of the businesses is to fit in with family life. Mrs Macaskill believes the company is sustainable, despite keen competition in the market. "People like to have a wee bit of luxury in their lives and we offer something that’s a wee bit different," she said.